ESPN play-by-play commentator and Voice of the Boston Red Sox Dave O’Brien ’86 will visit the Newhouse School along with his broadcast partner, Doris Burke, on Friday, Jan. 17, as guests of the Newhouse Sports Media Center. They will discuss their careers in sports broadcasting at 5 p.m. in the Miron Room, 303 Newhouse 1. The event is open to the public. Follow on Twitter at #NewhouseSports. O’Brien, a Newhouse alumnus, joined ESPN in 2002. He serves as a play-by-play commentator for MLB Wednesday Night Baseball and for college basketball and baseball and NBA games. He has done radio play-by-play for the Boston Red Sox since 2007. He was previously the television voice of the New York Mets and the voice of the Florida Marlins. Burke, a basketball analyst and reporter for ESPN, calls both men’s and women’s college and pro contests. 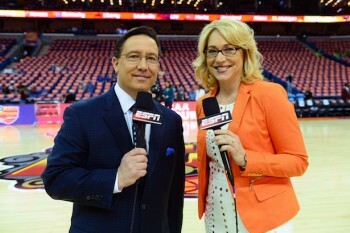 She previously served as a WNBA analyst for the New York Liberty on MSG Network and also was a women’s college basketball analyst for CBS Sports and Westwood One Radio. She was the first woman to call Knicks radio/television broadcast (2000) and a Big East men’s basketball game on television. This is the first of many spring semester events sponsored by the Newhouse Sports Media Center, including a visit from ESPN’s Sean McDonough ’84 and Jay Bilas on Sunday, Feb. 2; coffee with ESPN’s Carter Blackburn ’01 on Monday, Feb. 10; and a day-long forum on Diversity in Sports Media on Wednesday, Feb. 26. For more information, contact John Nicholson at 315-443-4065 or jsnich01@syr.edu.